In the dusk of my dreams I have wandered through pointy roofed pavillions spilling across a shallow hillside, reaching the darkened road that runs below. It is a fair, the greatest exhibition of humankind’s noblest pursuit, born out of a quest for the meaning of being alive. These are the laboratories in which different cultures have have created the social alchemy called religion, a construct of humanity that is valued for its endowment of purpose and plagued by the folly of its zealots. Which shelter will I enter? Who will I be when I come out the other side? What if I must chase my soul down the dark road and it hides behind damp brick walls? 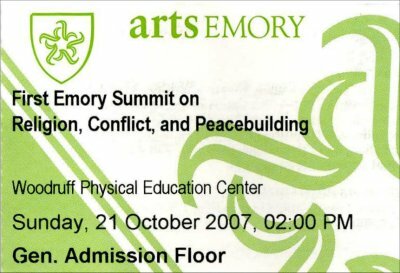 His Holiness and Sister Joan were speaking at a summit hosted by Emory University, called The First Emory Summit on Religion, Conflict and Peacebuilding. Joining them on the dais were: Professor Rajmohan Gandhi, a human rights activist and grandson of the Mahatma; Rabbi David Rosen, an activist in the arena of interreligious dialogue; and Professor Abdullahi Ahmed An-Na’im, a law professor at Emory and scholar of Islamic law and politics. When minds like that get together, it is moving, inspiring and sparky. Rabbi Rosen called them all “religious personalities,” and I suppose the title fits. I mean, the Dalai Lama is a rock star (and we are all groupies – just what religion needs). Like the title of the summit suggests, it was just a conversation. No pacts were made. No treaties were signed, and despite the larger than life presence of the Dalai Lama, no religion took the lead over any other. The discussion was not about good vs. evil, God vs. the Devil, or do-gooders vs. evil-doers. Instead, there was an instant understanding that, “It is not the traditions; it is the believers,” as Professor An-Na’im said. As for the President’s “evil-doers”, His Holiness forgivingly called them “mischievous” people who cast a bad light on their faith. Professor Gandhi seems to agree.”When you set out to destroy what you dislike, you also destroy what you love,” he said, relating the story (from his brother Ramchandra’s book Sita’s Kitchen) of a group of Hindus that took hammers to an ancient mosque and ended up destroying an even more ancient Hindu holy site known as Sita’s Kitchen. Then no one’s soul will have to be coaxed out of dark, damp alleys, for mischief cannot hide where faith will bear no darkness.